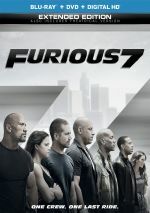 14 years after the franchise’s debut, 2015’s Furious 7 became easily the biggest hit in the Fast and the Furious series. With a gross of $353 million US and $1.52 billion worldwide, the film demonstrated that audiences still loved the Furious brand of wild car-based mayhem. Inevitably, this led to 2017’s The Fate of the Furious, a movie that made megabucks but showed a drop from its predecessor – at least in the US. Does it seem ominous that Fate became the first movie since the third one to not improve on the prior flick’s gross? Maybe – we’ll have to wait for the ninth movie in 2019 to see. In any case, Fate still took in tons of money – it’s just that its $225 million US showed an awfully steep drop compared to Furious 7’s $353 million. No one at Universal will sneeze at Fate’s $1.24 billion worldwide take, though, so I suspect the franchise suffers from no danger of cancellation. Whether or not the series boasts any remaining creative potential remains to be seen, though, as Fate shows signs of rust. After much drama, Dominic Toretto (Vin Diesel) and Letty Ortiz (Michelle Rodriguez) finally marry and go on honeymoon in Cuba. However, matters take an unexpected turn when noted cyberterrorist “Cipher” (Charlize Theron) recruits Dom for her side. This leads to conflict, as Dom seems to betray his “family”. 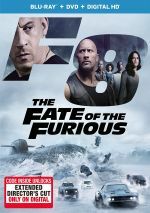 With additional tension via the unhappy union of enemies Luke Hobbs (Dwayne Johnson) and Deckard Shaw (Jason Statham), Letty and the rest of Dom’s team deal with Cipher’s threat and try to bring their boss back to the side of good. Despite all the crazed action, I found myself bored with Fate. The franchise just seems to be out of ideas, like the filmmakers realize they've pushed the limits of what and where these characters can go. It never felt logical to me that some street racers from LA morphed into International Men - and Women - of Mystery, and the farther along the franchise goes, the less sense this makes. Fate pushes any sense of sanity to involve its characters in global intrigue and it just gets too ridiculous. Fate also has way too many mouths to feed. Every movie "needs" to add new "name" actors, so each one pads the roster of characters more and makes the result more unwieldy. Each character requires some time in the spotlight, which means no one gets much real attention and the whole thing seems forced and contrived. This especially feels true due to the frequent choices to make enemies friends and vice versa. Sure, it's a cute gimmick to make Dom "go rogue" - especially as it becomes a betrayal of the oft-repeated "family" theme - but it doesn't work, as we never buy Dom's turn of heart at all. Theron creates a dull villain, and she shows no chemistry with Diesel. All the other actors get lost in the morass, though I will admit Helen Mirren's quick turn offers a little saucy fun. I realize the story and character bits exist to motivate the action, but even those moments fall flat. The film tries to wow us with its over the top pieces but without a compelling story, they don't fare very well. The movie enjoyed lots of bombast but little real excitement. Fate isn't a terrible movie but it's surprisingly dull for a big action flick. Hopefully Furious 9 will offer a rebound. The Fate of the Furious appears in an aspect ratio of approximately 2.40:1 on this Blu-ray Disc. This became an excellent presentation. Sharpness worked well. At no point did I discern any softness, so the film was accurate and well-defined. I saw no signs of jaggies or moiré effects, and the film lacked edge haloes or print flaws. If you suspected Fate would come with the modern standard teal and orange palette, you’ll get what you expected, though not to an extreme. While the flick went with those overtones, they didn’t overwhelm. I’d like to see action flicks dispense with those conceits, but given their ambitions, they looked fine here. I felt happy with the solid DTS-X soundtrack of Fate. Downconverted to DTS-HD MA 7.1, the mix offered plenty of opportunities for lively auditory information, and it took good advantage of these. When we shift to extras, we launch with an audio commentary from director F. Gary Gray. He delivers a running, screen-specific discussion of story/characters, sets and locations, cars and other vehicles, stunts and action, visual design, and related elements. While Gray gives us a decent array of thoughts, he tends toward perky hyperbole much of the time. This means we find lots of praise for the movie and all involved. We still learn some movie insights but these tend to get submerged under all the happy talk. Two Extended Fight Scenes fill a total of five minutes, three seconds. We find “Extended Prison Fight” (2:59) and “Extended Plane Fight” (2:04). They expand the scenes from the final film to give us more violence and mayhem. They’re not especially interesting. Four featurettes follow. The Cuban Spirit lasts eight minutes, four seconds and includes info from Gray, producer Neal H. Moritz, gaffer Vladimir Martinez Gomez, writer/executive producer Chris Morgan, and actors Michelle Rodriguez, Vin Diesel, Janmarco Santiago, abd Celestino Coriell. As expected, “Spirit” covers aspects of the shoot in Cuba. Some nuggets emerge but this mostly feels like an advertisement for Cuban tourism. Under In the Family, we get four segments: “Betraying the Family: Cipher and Dom” (6:35), “Leaderless: A Family Lost” (5:00), “Shaw Family Values” (3:56) and “Meet the Nobodys” (5:45). Across these, we hear from Gray, Moritz, Morgan, and actors Charlize Theron, Dwayne Johnson, Nathalie Emmanuel, Chris “Ludacris” Bridges, Luke Evans, Helen Mirren, Scott Eastwood and Kurt Russell. Across these clips, we learn about story/characters as well as cast and performances. These segments tend to be superficial and without much depth. Car Culture splits into three pieces: “The Hero Cars of Fast” (10:24), “Zombie Cars” (5:35) and “The Ripsaw” (5:22). These offer details from Gray, Diesel, Moritz, Johnson, Theron, picture car coordinator Dennis McCarthy, production designer Bill Brzeski, 2nd unit stunt coordinator Andrew Gill, 2nd unit director/stunt coordinator Spiro Razatos, special effects supervisor JD Schwalm, Howe and Howe Technologies’ Geoffrey Howe, and stuntman Erik Betts. As expected, these reels look at the movie’s vehicles. Some good information emerges, but as usual, we find these notes slightly submerged under all the praise and hype. Finally, All About the Stunts breaks into three more clips: “Malecon Street Race” (6:15), “Iceland Stunt Diaries” (6:45) and “The Streets of New York” (5:27). In these, we locate comments from Gray, Gill, McCarthy, Moritz, Diesel, Morgan, Razatos, Schwalm, Betts, stuntman Tony Carbajal, assistant location manager Miguel Tapia, and safety coordinator Vernhard Gudnason. Like the title says, these featurettes examine stunts and action. They follow the path of the prior pieces, so they combine useful facts with hyperbole. The disc opens with ads for The Mummy (2017), the Fast and Furious theme park attraction, Dead Again in Tombstone, Despicable Me 3 and Collide. No trailer for Fate appears here. A second disc presents a DVD copy of Fate. It includes the commentary, “All About the Stunts” and the “Extended Fight Scenes”. Note that fans can view an “Extended Director’s Cut” of Fate - but they won’t find it oon the Blu-ray. Unfortunately, Universal chose to make the EDC available only as a download. I think that’s a real slap in the face of people who purchase the Blu-ray – the EDC should be on the disc. Eight films into the franchise, The Fate of the Furious demonstrates a lack of creativity. While it throws plenty of over the top action and mayhem at the viewer, little of this material sticks, so the end result feels oddly dull. The Blu-ray brings us excellent picture and audio along with a decent complement of bonus materials. Fate gives us a loud but lifeless experience.